Yes – that’s me!Days and months slid by and I hit my two-year surgery anniversary date. I’d been successfully at my goal weight for eighteen months. I still didn’t like shopping for clothes and my feeling bristled less from weight loss compliments. My wish of visiting Dorly’s studio still existed, yet fear continued to push making an appointment away from my conscience mind. I followed Dorly’s work on Facebook. Each portrait was better than the next. I gaped at people who were already beautiful transforming into angelic creatures she captured with her camera. I continued to avoid the camera as I struggled with my own body image. ‘something else’ to happen. I still felt stuck in the editing process. I needed to find an ending so I could start at another beginning. The Velveteen Rabbit was one of the first books I remember reading. As an adult, I cherished my tattered and worn copy. It was this particular quote that always brought me to tears. 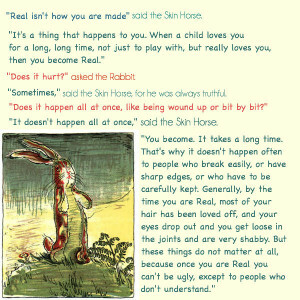 I thought it was the rabbit becoming real that would get me so emotional, but after booking my consultation with Dorly, the book’s message took on an entirely new meaning. I was Real before I lost the excess weight. I loved myself back to a healthy weight with a lot of work. Like the Rabbit, I’d taken a beating over a long time. His fur was my weight. His eyes falling out became my healing psyche. I was ready to show my Real.